This fall semester, the Thief River Falls campus chapter of Phi Theta Kappa took on a unique challenge. Phi Theta Kappa is the honorary society for two-year community colleges across the U.S., and as a part of a service learning project, the students explored how recycling works in Pennington County; they also examined how this relates to the recycling that occurs on the Thief River Falls campus. 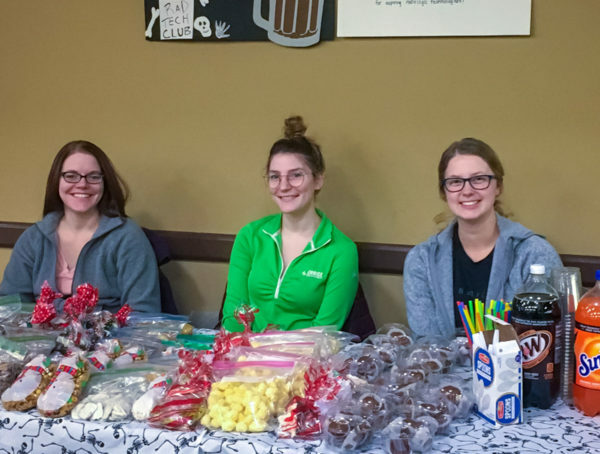 During a four-month research project, the Phi Theta Kappa officers Chelsey Srnsky, Gracie Hannon, and Mikenna Housker researched revamping campus recycling, traveled to Les’ Sanitation in Thief River Falls and toured the recycling facilities and discovered the real story on the life cycle of everyday items we throw away. What they learned was surprising: in a rural area like ours, taking care and paying attention to the kind of plastics we attempt to recycle can be the difference between a dumpster full of plastics having a new life, or earning a one-way trip to a landfill. Not all paper is created equal, and sometimes even trace amounts of food can make a cardboard box unsalvageable. Suffice it to say, the best intentions when it comes to conservation and recycling can often have opposite impacts. The officers will be presenting their findings in a formal presentation this month, along with new suggestions to streamline campus recycling efforts and education students and staff on what to recycle, and where. The presentation will be followed up with a proposal in the spring to jumpstart a new campus recycling program that will be unveiled on Earth Day 2019.